Recently, several members of a family were taken to the hospital after consuming chicken. Currently the case this is under investigation, but is just one report supporting a finding by the Centers for Disease Control and Prevention that poultry products cause the most food poisoning infections in the past few years. However, proper storage, handling and preparation practices can help prevent bacterial growth that leads to foodborne illnesses. A group of eight include two adults and six children in Mauranipur, India became ill after eating a meal including chicken, according to the Times of India. After consuming the poultry, the family began experiencing symptoms of foodborne illness and were transported to a nearby hospital. Samples of the food was sent to a lab for testing to confirm the case of foodborne illness. This illustrates recent findings by the CDC that poultry products are the leading cause of food poisoning cases. The CDC recently released a report that found that chicken, turkey and other poultry items caused 17 percent of all foodborne sicknesses, stated NBC News. However, NBC News stated that these figures may be worse than they appear as experts estimate that only about 5 percent of food poisoning cases are recognized as part of an outbreak. In total, about 87 million individuals contract foodborne illnesses annually. Of these cases, 371,000 result in hospitalization and 5,700 end in death. When these types of food items are not stored, handled or prepared in a safe manner, bacteria and viruses can grow and cause food poisoning symptoms to appear in persons consuming these products. According to the Mayo Clinic, signs of food poisoning can include nausea, vomiting and abdominal pains, all experienced by the family before being hospitalized. Additionally, individuals may also have fevers, signs of dehydration, muscle weakness and difficulty speaking or swallowing. If people experience these symptoms, they should seek medical attention as soon as possible. The Mayo Clinic also advised contact the local health department to investigate any suspected cases of food poisoning. The CDC report stated that if food is left at an improper temperature, this can cause foodborne illness causing bacteria to grow. To avoid this, individuals should be sure to keep poultry products refrigerated at the optimal temperature. The FSIS noted that the danger zone for food, in which items have the highest chance of bacterial growth, is between 40 and 140 degrees Fahrenheit. Therefore, poultry items should be refrigerated below 40 degrees Fahrenheit as a best practice. As cold temperatures can slow bacterial growth, a storage unit set below 40 degrees Fahrenheit can prevent contamination of food items, according to the FSIS. A temperature monitoring device including a temperature sensor can ensure that refrigerators, freezers and all storage units maintain the best range to prevent bacterial growth. Additionally, when handling poultry products, consumers should be sure that they wash their hands frequently and adequately clean surfaces on which they are preparing the items. 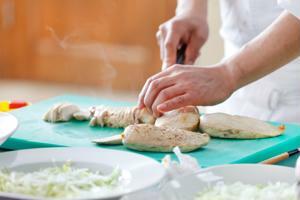 These practices can prevent cross contamination which can lead to foodborne illnesses.